Sunflower Brown Sugar Fudge made with SunButter sunflower butter, dark brown sugar, dark chocolate and flake sea salt. 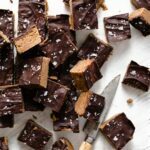 Delicious Christmas Fudge recipe. Line an 8x8, 9x9, or 7x11 tray with parchment paper. Place butter, brown sugar, heavy cream, and vanilla into a medium sauce pan on medium-high heat. Stir occasionally with wooden spoon until sugar and butter are melted. Mixture should just start to have bubbles in the center, but not come to a full raging boil. Add sunflower butter and stir until smooth. Place powdered sugar in bowl of stand mixer with paddle attachment. Pour hot mixture into bowl with sugar. Begin on medium low speed and gradually increase to medium high. Mix until a thick cookie dough consistency is formed. Place dough into pan and level with hands or spatula. Melt chocolate in a microwaveable safe bowl at 30 second intervals, stirring in between each, for 90 seconds. Pour melted chocolate onto fudge and level with spoon. Let chocolate cool for about 5 minutes then sprinkle with flake sea salt. Cover pan with aluminum foil and place in fridge for a minimum of one hour to set. Store fudge in an air tight container.